WDFW Invites Her to Make Formal Presentation, Senior Scientist with Forest Law Center Finds Research "Compelling"
I believe I understand why the elk in southwest Washington are being affected by the mysterious hoof disease, namely hoof rot. I have credible evidence and can provide a plausible diagnosis, source of disease, a detailed route and manifestation of the pathogen, as well as a cure. My findings also link Leptospirosis, Treponema Pallidum, numerous other bacterial infections, and the use of pesticides and herbicides into one, highly interconnected, evidence based theory. The hepatic selenium and copper deficiencies discovered by Washington State University will also play an important role in returning the elk to a healthy state. My findings suggest that all of the current theories presented play an important role in the health of our local elk herds. First, a little about myself. I am a farrier and have been studying equine hooves for over a decade. I specialize in the treatment and prevention of pathologies, including laminitis. Currently my efforts are being steered toward the local elk. But this runs deeper and a little more personal for me and my family. I have been controlling for known causes of hoof diseases in my own personal horses. However, since moving my little herd to Mt. Pleasant, in Cowlitz County, I’ve noticed a steady decline in their hoof health. They are showing subclinical signs of laminitis. This has led me to dig deeper into the situation and eventually brought me to research the local elk’s mysterious hoof disease. In my opinion the elk are being affected by the same thing as my horses as the signs and symptoms are strikingly identical to laminitis. Laminitis can be defined as the failure of the attachment between the bone and the inner hoof wall. However, laminitis itself is a misnomer, as the disease was named and the applied definition was widely used before we truly understood what happens during an episode of laminitis. There is a lot more going on than simply inflammation of the lamina structure and failure of attachment between the bone and inner hoof wall. The entire hoof capsule is unnaturally affected, resulting in catastrophic failure of hoof capsule-to-inner hoof attachment. One of the earliest clinical signs of laminitis, which often go unnoticed, are “hoof rings.” Though not always present, they are ridges running horizontally on the outer hoof wall. This is a sign of metabolic stress. Another early sign is reoccurring hoof abscessing. A stretched and/or detached lamina occurs when the hoof capsule begins to break away from the inner structures. This is seen from the profile view as a diverging toe angle, although in some cases the diverging toe angle is no longer present because the separation has advanced all the way to the coronary band. This can also be seen from the supine view as a stretched and/or detached white line. There is less sole concavity giving the appearance of a “dropped bony column.” If left without natural trimming (by man or through natural movement), the hoof horn will continue to grow far longer than natural lengths. This is because at a certain point the sole of the animal is more distal than the hoof wall, preventing natural wear. Additionally, the weakest point becomes the laminar attachment. Rather than wearing the hoof horn through natural movement, the laminar either tears away or stretches. This is why we often see the extra wall length and diverging toe angle. Other common signs of laminitis include inflammation and sometimes heat in the lower limb. Long term effects include grossly distorted hoof growth causing unnatural weight bearing, which eventually results in arthritic joints. Resistant bacteria, fungus and/or yeast infections are also very common to see throughout the entire process. Symptoms consist of acute and chronic weight-bearing pain. Oftentimes the animal will decrease movement, lie down, unnaturally shift and bear weight, or even avoid use of affected limb(s) altogether. Animals can be kept in the various stages of laminitis for years without advancing, but the final stage is hoof slough, where the entire hoof falls off. Often domestic horses in advanced stages of laminitis are euthanized to prevent further pain and suffering. Due to decreased mobility the undomesticated animal may starve or be especially prone to predators and hoof infection which may reach the most distal phalanx, eventually leading to a very slow and agonizing death. Laminitis has many triggers. Episodes are commonly caused by consumption of non-specie specific food, hormone imbalances, wormers, vaccinations, colic, herbicides and pesticides, and other herbivore toxins such as eating elevated levels of nitrogen. Mechanical forces do play a part in the physical distortion seen during laminitis, but only after the lamina, and other areas of the hoof, have been weakened from internal triggers. We see laminitis in large and small hoofed species; however, it is important to note that smaller animals generally are able to support their body weight while a larger animal, at the same phase of the condition, may not have the ability to do so. While there are many different types of laminitis, they are generally categorized by how it is caused, not their effects in the hoof. In endocrinopathic laminitis, we see a spike in the secretion of the hormones adrenocorticotropic hormone (ACTH), and in response to ACTH, the adrenal gland secretes extra cortisol (hyperadrenocorticism), the physiological glucocorticoid (GC) class of hormones. The increased levels of GCs interact with catecholamine hormones, which then act as a vasoconstrictor in the digital arteries, interfering with lamina perfusion within the hoof capsule, thus resulting in laminitis. In 2004, several experts from the College of Veterinary Medicine at the University of Missouri published a paper entitled Endocrinopathic Laminitis in the Horse which explains how any changes or alterations to interacting hormones pose a great risk of causing endocrinopathic laminitis. 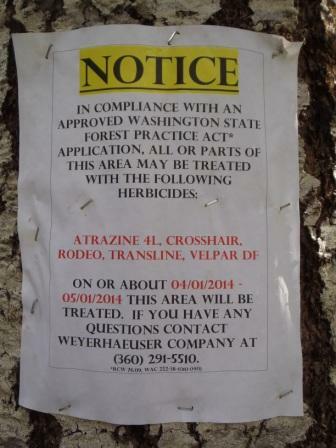 Additionally, in 2009 the Oxford Journal published a collaborative study looking at the effects of herbicides and metabolites on Wistar rats which found that one of the most common chemicals used during Weyerhaeuser herbicide spraying, Atrazine (ATR), significantly raises plasma ACTH, corticosterone (in the GC class of hormones), progesterone, and estrogens. Other herbicides and metabolites were also found to significantly raise ACTH, such as the herbicides Simazine (SIM), Propazine (PRO), and Metabolites Deisopropylatrazine (DIA), and Deethylatrazine (DEA). All of these are also reported to significantly disrupt the hypothalamic-pituitary-gonadal (HPG) axis. The researchers wrote that, “Significant increases of plasma ACTH were observed within 15 min, following exposure to ATR, SIM, PRO, DIA, or DEA. Dose-dependent elevations in CORT and progesterone were also observed at 15 and 30 min post-dosing with these compounds indicating an activation of adrenal steroidogenesis (78).” The study includes many other harmful effects such as reproductive and sexual maturity complications which are widely informative for environmental and wildlife purposes. Linking the two findings, it is clear that the use of any chemical that raises ACTH will directly increase the class of GC hormones, resulting in a chemically induced endocrinopathic laminitis. It is also critical to note that exposure to toxic chemicals is likely only one way the elk are currently developing laminitis. Chemicals can also affect the gastrointestinal track which can eventually lead to laminitis as well. Any matter ingested that disturbs the naturally balanced intestinal microorganisms is at risk for causing laminitis. The use of toxic herbicides may also be leading to the mineral deficiencies reported in the affected elk. Whether the chemicals are causing a deficiency through eradicating natural mineral sources, or because laminitis is inhibiting natural herd movement which prevents the elk from accessing natural occurring minerals is not yet understood. But this information will be important to return the elk back to health. Gaining access to the current use of chemicals and all ingredients used in the area will be a critical first step to cure this hoof disease. Many other chemicals and unnatural influences cause laminitis by affecting other areas of the species. Therefore, it is important to access a list of all chemicals and ingredients being used on the environment by Weyerhaeuser. “Typically, pure herbicide molecules are of limited value to end users. To give them practical value and make them usable, most herbicides are combined with appropriate solvents or surfactants to obtain a formulation. A given chemical may be formulated in a variety of differing formulations and sold under different trade names. For this reason, pure AIs [active ingredients] are mixed with coformulants, also called ‘inert’ or auxiliary substances, to allow their use in common and convenient vehicles, such as water, and to obtain uniform and effective distributions. Several substances fall within the definition of coformulant, including: carrier substances, solvents, surfactants, dispersing agents, adhesives, absorption-promoting agents, antioxidants, bactericides, dyes, fillers, and perfumes. Coformulants can have various technical and physico/chemical properties in relation to their function in the pesticide formulation. These chemicals can be expected to have various toxicological profiles, some of them harmless (e.g., water) and some with serious toxicological properties (e.g., the organic solvent isophorone, which is a suspected carcinogen). Because coformulants represent the highest amount in pesticide mixtures, even a minor toxicological concern could become significant in relation to their use (Tobiassen et al., 2003) especially considering the fact that, besides being toxic themselves, they can also increase the toxic effects of AIs”. Being that many active ingredients have the potential to cause other complications, it would be critical to have access to such ingredients used by Weyerhaeuser. This area needs more investigation, but it is clear, chemicals are not natural to the species, and do negatively alter the health of the entire environment including the elk. It is my belief that herbicides and pesticides are the root cause of the plummeting health in the free-roaming elk in southwest Washington. Atrazine being an “immunotoxic,” inhibits the elk and other exposed species (human and domestic animals as well), from fighting off harmful bacteria and other communicable diseases they are routinely and naturally exposed to. It is my belief this is why we are finding widespread diseases such as Leptospirosis, T. Pallidum, and numerous other bacterial infections. If it isn’t these diseases, it will be the next ones that create another endemic. Simply treating for infectious diseases alone will not cure the animal; however, these diseases do grossly complicate the situation and weaken the animal to a greater extent. All forms of laminitis are extremely difficult to treat in that it doesn’t respond well to medication, requires all laminitic triggers (and there are many) to be removed from the affected animal’s environment, and to get the animal moving in a natural way which requires restoring an environment natural to the specie. While there may be a few triggers causing such severe hoof pathology, it can take just one to prevent complete healing. The only known cure for chemically induced endocrinopathic laminitis is to cease the use of all chemicals, especially the ones which manipulate the endocrine system. Medical treatment will be ineffective for as long as the hypothalamic-pituitary-gonadal (HPG) axis is disrupted, and is unnecessary once HPG axis is restored back to normal. It will take time to rid the environment of such chemicals, but until this time, the elk will be kept in a laminitic state and will continue to digress. Once all chemicals are cleaned from the environment, a onetime hoof trimming and application of White Lightning hoof treatment mixed with equal parts white vinegar will eliminate bacterial, fungal, and yeast infections including hoof rot, thrush, white line disease and other skin fungus. This will be helpful to get the elk moving in a more natural way and allow self trimming and natural healthy bacteria to inhabit the hoof from thereon after. Healing can be documented by examining the health of the new hoof growth, and measuring the progressive change in the diverging toe angle. Allowing the immune system to be restored will help keep the animal from being re-infected by other diseases. Treatment and vaccinating for Leptospirosis, T. Pallidum and other communicable disease creates a difficult situation because such treatments and vaccines can actually prolong or advance laminitis. The risks and benefits of treatment options will need to be discussed. One aspect of the cure that is in our favor is that these elk are already in their natural habitat. We do however need to restore the habitat to a natural healthy state as is often necessary with domesticated animals. Identifying what areas of the habitat need restoring will depend on fully understanding elk behavior, how they access minerals, necessary plant life and ensuring the ecosystem is restored to a state where it can manage itself once again. It is my recommendation that controlled burning is used instead of chemically engineered herbicides and pesticides. Due to naturally occurring wild fires, the ecosystem is adapted to handle such burnings, but is destroyed by toxic chemicals. I would also make a strong recommendation for people and domestic animals, especially horses, to either stay away from infected areas, or at least avoid eating or drinking from contaminated sources. Local horses especially are at great risk. Thank you for your article. I have always treated my horse herd as close to natural in training and health maintenance. That includes to many people who over vaccinate and deworm is not natural. I appreciate the fact that you are researching and getting this information out there. 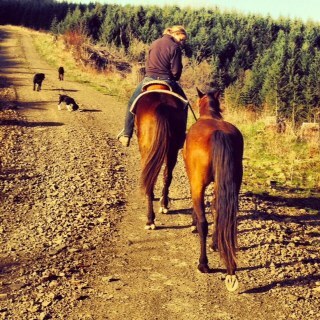 My horses (18) of them rarely cost me vet bills being raised the natural way. Thank you for researching this. May also have implications when it comes to GMO food crops and crops dessicated with glyphosate. I am so happy that somebody has researched this deeper than I could ever imagine.I was the guy that got the largest herd of elk with hoofrot on camera and was on King 5 news regarding this issue.I just want to thank you for your response.As a hunter in the same area, in the Mount St. Helens tree farm, for over 40 years, when I saw this all going on, it worried me. Thank you, thank you, thank you. Thanks for pointing out in such clarity what has been the views of the thousands of sportsmen and women who have watched the herds suffer and decay to a dismal existence over the last 2 decades. I hope your analysis doesn’t fall on deaf ears with the state’s politicians and most of all with Weyco itself. The herd was healthy and robust until the spraying started and went downhill very quickly afterwards. I’m not a biologist but I’m smart enough to know that things aren’t right and won’t get better unless forestry habits change. I hope it’s not too late to save the wildlife in our state but I have my doubts. It will take generations of animals to get this disease out of the system for good. WeyCo better wake up! with all our access being closed up for money. All the bad logging practice going on, maybe it’s time for a class Action law suit! they purchased most of “their lands” from the state [us] with the agreement the land was to stay open for public use. They pay a fraction of the amount of taxes of any other land owner. yes I know about Forestry/ Farm bills to help our farmers and forests. The good Lord knows they need help. weyco is taking themselves out of this group by the way they cheat and deceive the public! I am also sick of hearing that they have to close up lands due to garbage and vandalism. Yes it does happen. I have been on landing after they have logged an area and seen 5 gallon barrels of hydraulic fluid crushed or partially berried. Garbage from the loggers themselves. Cables just left stretched out among other things!There is vandalism in public schools too, do they get shut down for it? If you are an outdoors man in SW. Wa. you know I am telling the truth!! This disease has jumped the Columbia River to Oregon’ in Washington and Multnomah County, I’ll bet Columbia County, too. The Elk must be crossing the Lewis and Clark Bridge late at night to spread it (if you’ve been brain washed by WAYCO); or, Weyerhaeuser must be using Atrazine in Washington County and Columbia County now. Many Elk migrate east each year along the Columbia River ridge, some all the way to Portland West Hills.